We are an autonomous collective of friends and peers that like to camp together at Pennsic and often will collaborate for support at Atlantian events as well. 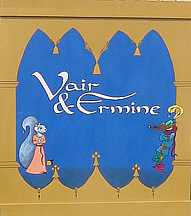 Though originally the combined camp of Sir Corby and Earl Amalric's households, named for the Vair in Mistress Thjora's arms and the Ermine in Countess Caia's arms, Vair and Ermine continues to grow. We now include but aren't limited to: Sir Corby and Mistress Thjora (and House de la Flamme), Master Alan and Mistress Genevieve (and Casa Gravesend), Sir Roland and Mistress Theodora, Duchess Kyneburh and Lord Helmut, Master Aedan and Lady Ella, Mistress Elspet and Baron Robert, Master Robert and Mistress Isobel (and company), and Lord Kathall and Lady Ariana. War Standards: Inspired by Corby's non-engineering skills and his comment about how a whole row of flapping war standards could be cool, Vair and Ermine decided to tackle the ambitious project of creating new and improved flagpole technology and as many war standards as possible. Reynard's brain was liberally picked for ideas on building the flagpole that Alan and Thjora set to work creating a prototype. Theodora, Kyneburh and Thjora set about doing the research and tests for creating the painted silk war standards to fly from the new and improved poles. 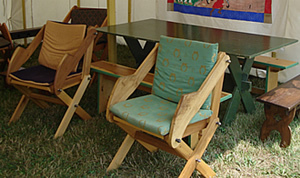 One weekend workshop saw a flurry of activity in building frames for the silk to be stretched on, stretching silk on frames, designing the war standard elements, testing layout and painting techniques, as well as building more flagpoles. 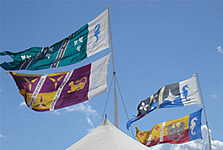 More work was done over the weeks leading up to War, and in total Vair and Ermine boasted 10 war standards flying on 7 flagpoles at Pennsic 37. Kitchen Herb Garden: Theodora started bringing various edible herbs to Pennsic to create an herb garden next to our kitchen tent at war. The herb garden varies each year depending on who brings what to contribute, and the main restrictions are that the herbs must be edible and period. Since we don't want to poison our friends, the foxglove and rue remain at home. The latest installment of the herb garden boasted hyssop, tansy, rosemary, mint, thyme, oregano, parsley, lavender, sage, basil, etc. Some years items are purchased, but most of the herbs are dug out of someone's garden and returned at the end of the war. We have an admittedly plastic rock wall system and usually does a good job of retaining the garden, and usually Genevieve can be seen rock hunting at Pennsic in order to fill in and conceal the edges of pots and such. After initially mocking Theodora for the idea of an herb garden at Pennsic, Genevieve now embraces the concept (despite not cooking) and contributes as needed. Vigil Services: Various members of Vair and Ermine have solicited and committed our collective canvas piles and furnishings, as well as efforts at hospitality, to contribute to the Peerage Vigils of family and friends. 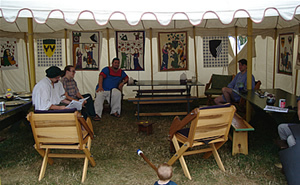 It is always a joy to be a part of someone's brief rest on their journey in the SCA.